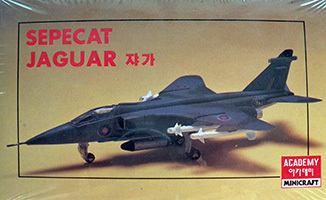 A brief rundown of the various model kits available of the Jaguar. A diecast model originally released as part of an ongoing magazine series, but readily available on eBay etc. 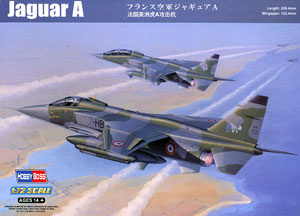 Released in French Jaguar A and RAF Jaguar GR.3 flavours, it's not a bad effort overall though the RAF version's overwing missile rails are too long and the overall grey scheme isn't accurate either. 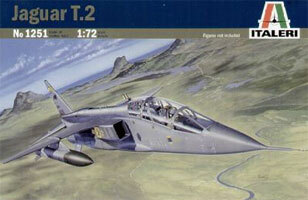 Ancient and comparatively rare these days, Heller released this kit in A, E and M versions. The diminutive size means that detail is scant but the overall shapes aren't too bad in comparison with the prototypes. The Jaguar M is the only mainstream kit available of this version in any scale. Far superior to the later Academy kit, this one generally looks the part though the canopy is a little squashed looking and the rear stabilisers are a little large and oddly shaped. 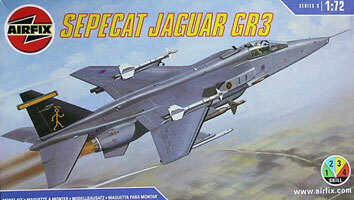 Released twice, in Jaguar S (pointy nose) and GR.1 (chisel nose) forms, with decals for a single grey/green RAF example. 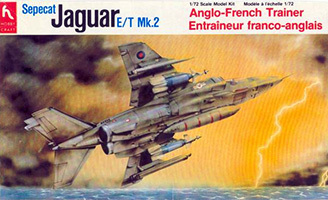 A pretty crude and ugly representation of the Jaguar, with oversize intakes, an ant eater for a nose, squashed canopy, woefully shaped drop tanks, no overwing missile rails (but you do get the missiles! ), and possibly the worst representation of the undercarriage in any kit of the type. 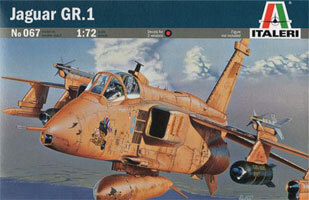 Most often found with Operation Granby decals for a desert pink Jag. Avoid! Supposedly all 1/144 Jaguar kits stem from the original LS/Arii mould but I find it hard to reconcile with the obvious differences in appearance between this kit and the LS ones. Certainly the best fitting Jaguar kit around. The area around the cannons is by far the best representation in any of the various kits available. Surface detail is delicate, mostly dead-on accuracy wise and generally the best out there. Includes a cockpit access ladder though it's thickly done. Nice pilot figure. The pylons are rather basic but shapes are good. Wing span nearly dead on, just an inch short. Nose a little too long but the shape looks good to me. Accuracy-wise it has a few issues though none are major. There are crude bumps for the blade aerials on the spine and near the wing tips. Anti-collision lights and mounts on the spine and belly are wrong for all but early Jags. Arrestor hook pretty poor but easy to cut off and replace with a strip of plastic. Undercarriage very simplified. Airbrakes are awful - raised bumps instead of perforations. There's an odd bump under the nose that doesn't exist on the real thing and the LRMTS windows are moulded solid. The cockpit is very basic - blank consoles and decals with an awful attempt at the seat. The weapon fit is a dead loss - some fairly decent SNEB rockets (rarely carried), basic BL755s and some 'for the bin' Matra Magic AAMs which RAF Jags never ever ever carried (there is a Jaguar International demonstrator decal option, for which the Magics are OK). The overwing pylons don't bear much relation to those used by RAF Jags either (being based on the different Jaguar International ones). Underneath the guns there are no bulges or ejector chutes. Also no chaff/flare dispensers for the rear fuselage. 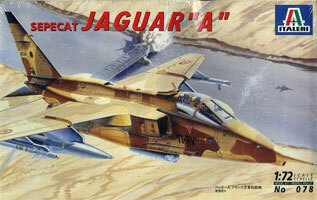 No drop tanks except in the limited edition 'SP54 Jaguar Desert Storm' re-issue of the kit, which has a pair of them. Despite all the above this is clearly the best Jaguar kit in this (or indeed any) scale and the fine recessed detail and excellent fit are not to be sniffed at! When combined with some additional detailing this kit can make a really stunning model. Eduard do a couple of etched detail sets for the GR.1 and A versions of this kit, covering the cockpit, afterburner rings, airbrakes (which are superb), nose gear doors, chaff/flare dispensers (GR.1), landing gear brake lines, pylon bases as well as various aerials and drop tank/missile fins etc. The instrument panel differences between A and GR.1 are catered for in each set. 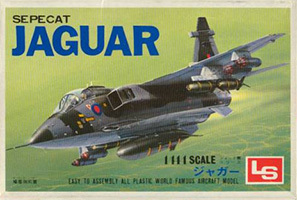 PP Aeroparts also did etched airbrakes (though they aren't as nice as Eduard's efforts) and an access ladder suitable for this kit (or indeed any 1/72 Jaguar). As per the GR.1/A kits but includes three drop tanks - two RAF ones and a French one with the t-shaped fins. 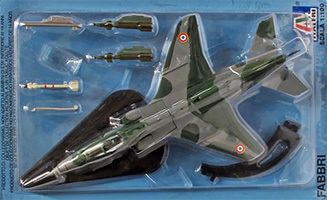 Re-issued with decals for two raspberry ripple DERA-operated t-birds, and also re-issued with a French 30th anniversary scheme. Both these boxings were limited editions so tend to be pricier if you can find them at all. Accuracy and quality just as good as the single seater boxings with the exception of the nose probe - this is provided only as the refuelling probe mounted on French Jaguar Es, and thus if you are modelling an RAF jet you need to cut it off and manufacture a pitot probe to go in its place. 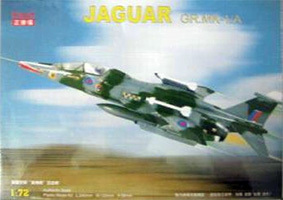 Hasegawa continue to re-issue their Jag kit in various boxings with new decals but no plastic changes, most recently there's been a boxing including the GR.1 and T.2 kits together in the all-black schemes used by the ground running examples at RAF Cranwell - expensive at full RRP but available for more reasonable prices on eBay/Amazon etc. This looks like a really nice kit at first glance; however, it has a lot of bad points and goes together pretty poorly, needing lots of filler and sanding down - and that's after a lot of test-fitting and fettling to get things to go together! Weapons are better than the Hasegawa kit, with two (wildly inaccurate) drop tanks, a fairly decent Phimat and pylon adapter, the rarely-used big recce pod, a basic ALQ-101 ECM pod, some fairly decent Sidewinders... but we won't mention the godawful cluster bombs. The centreline pylon is great; the overwing pylons will do but the underwing pylons are rubbish - the inner ones are too small, the outer ones are too big! Arrestor hook is at least present unlike other 1/72 kits, but is too thick and the mounting point bears no relation to the real thing. Jetpipes deeper than Hasegawa which is good, but ejection pin marks right in the middle of the engine detail. Chaff/flare dispensers (albeit basically done) and cannon bulges (which are a bit too thin but are the right length) are provided. Airbrakes have perforations, but in the wrong place, and they'd have you put the jack that opens them in the wrong place (other side of the perforated area). Cannons are shown as being visible in the cannon ports - not so - a tricky job to scrape them out of existence. Detail-wise the surface engraving is a bit heavier than on the Hasegawa kit and not as accurate though generally fairly good. The cockpit in the single seater is a basic tub with fictional detail on the consoles, with a better attempt at an ejector seat than Hasegawa, though that's not saying much. Undercarriage and airbrake bays have some fictional detail moulded in them. Undercarriage basically the same as the Hasegawa kit in its simplification. Ventral fin locating holes not quite in the right place, so the fins will be at entirely the wrong angle if you don't fill the holes, cut off the locating tabs and put them in the right position. LRMTS windows solid again. Wingspan 3 inches too wide. One noticeable problem is the fuselage spine is far too thick and does not capture the contours of the real thing very well. The seperate panel in the kit for the underside of the rear fuselage contains a wealth of detail, much of which is wrong! The positions of the small fins and tear-drop shaped vents towards the rear have been reversed, ie. where the little fin is, the vent should be and vice versa. There are faint lines marking the position where the chaff/flare dispensers go, but they are in entirely the wrong place - should be a whole centimeter further forward (not a scale centimeter, a real one!). There are two blobs between the hole for the arrestor hook and the small fairing further forward - no idea what these are, they're not on the real thing! Decals are pretty rubbish too. 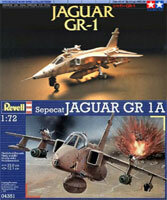 The kit was originally released by Italeri in both A and GR.1 boxings; since then Revell and Tamiya have re-released the GR.1 version (Revell as a GR.3); both these alternative boxings have far superior decals to the Italeri release though oddly it is the Italeri boxing that is more commonly available. The Italeri A model box, however, is pretty rare now. 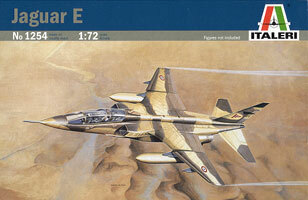 Eduard did a now discontinued etched detail set for the A version of this kit, covering the cockpit, jetpipes, airbrakes and nose gear doors as well as various aerials and drop tank fins etc. Oddly, while a later release than their detail sets for the Hasegawa kit, it covered fewer items and the airbrakes aren't as good. All remarks as per GR.1 kit but the T.2 cockpit is actually a pretty decent attempt with throttle quadrants on the side consoles and some sidewall detail - the GR.1/3/A kits lack both of these details. Provides the correct pitot probe for the nose, unlike the Hasegawa kit, but the decals for the RAF version are wildly wrong being far too large - they're basically unuseable. 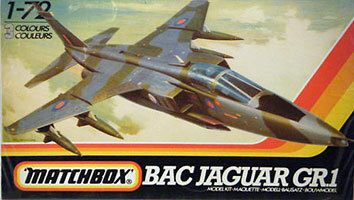 A modern kit of the Jaguar was good news, but sadly this one is a huge missed opportunity. Overall detailing, recessed panel lines etc. is very finely done and even exceeds the standards of the Hasegawa kit, albeit some panel lines are fictional and others missed out. The cockpit is, however, even more basic than the old Hasegawa kit, with flat side consoles and an inaccurate decal only for the main instrument panel. The side of the nose includes a stiffening/repair plate (on both sides) fitted to whichever airframe it was they measured up and which would not apply to any other jet. While it does have complete undercarriage bays unlike the Hasegawa kit, they are somewhat depopulated (based on a preserved example no doubt) and the gear legs are more basic and as the gear doors are pretty much always closed on the ground having full bays is fairly pointless. The forward nose gear door bears little relation to the real thing. The airbrakes are - unforgivably - moulded both closed (they're always open on the ground) with no perforations, and also split across two parts so even cutting them out is going to be more annoying than necessary, requiring both replacement airbrakes and also building a bay on each side. 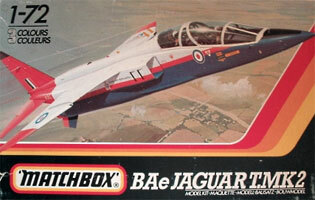 Also, as usual with Jaguar kits, the wing slats and flaps are moulded closed too. The step in the trailing edge of the rear stabilisers is barely represented. Intake relief doors are moulded open (like the old Airfix kit), which is appropriate for ground-running or take-off but not in flight or parked up. The kit's saving grace is an impressive load of French ordnance - enough to start - and finish - a small war! The pylons are also the correct French types. If you can get hold of this one cheaper than the truly excessive RRP (which loses this kit a star), it's worth a go. At the time of writing, for instance, Creative Models are doing this kit for a little more than a tenner - at that price it's worth a look. Eduard do a pre-painted etched detail set specifically for the Hobby Boss Jaguar A kit which mostly spruces up the very bare cockpit but also replaces the very poor nose gear doors - however at a tenner or so it makes an already expensive kit even pricier. 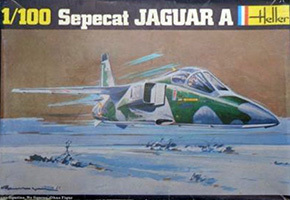 Everything that applies to the Jaguar A kit, above, applies here too. 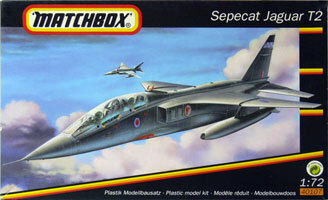 The E issue of this kit differs only in decals and the provision of completely new fuselage halves (i.e. 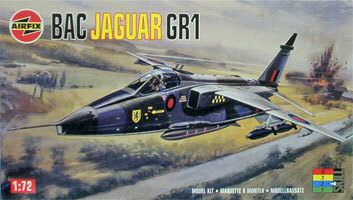 unlike other Jaguar kits, the nose section is not a separate unit). Again, hugely overpriced for what you get, though at the time of writing Creative Models are doing it for around the £16 mark which isn't quite as bad. Again Eduard do an etched detail set specifically for this kit, once again covering the cockpits and nose gear doors. 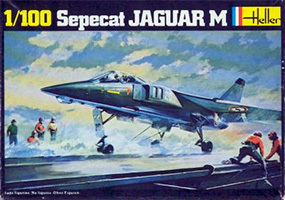 This was Airfix's first attempt at a Jag and is based on the early prototypes, with short fin, no ventral strakes, square tipped wings, big splitter plates and pointy nose. It comes with an impressive load of fairly naff stores - 4 AS-12s, 2 rocket pods, 4 Sidewinders, a combined rocket pod/drop tank for the centreline and decals for the first British prototype - XW560. Mostly raised panel lines with some recessed lines for control surfaces. For its time this was a decent effort, and would be a good basis for a model of the prototypes. A much more basic kit compared to Hasegawa or Italeri with raised panel lines (thankfully not too many of them as they're poorly done and mostly inaccurate). 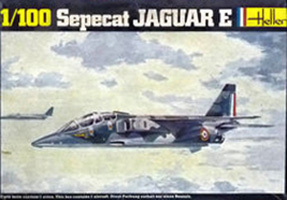 This is a re-issue of the original Airfix kit of the prototype with various changes made to reflect the production examples including nose gear, nose gear doors, intakes and splitter plates, rounded wing tips and larger fin. Wingspan 6 inches too wide. The arrestor hook is heavily and poorly done. Jetpipes are awful. Only one drop tank. Noticeable step on the nose where they obviously changed the mould to do the chisel-nose instead of the original sharp nose. Tailplanes are mounted too far forwards by about 2mm, easy to fix though. On the plus side the airbrakes are perforated correctly, though the brakes themselves are the wrong shape, and the main gear legs are a little bit better in some ways than those on the Hasegawa or Italeri kits. Er... but that's about it really. The intakes have open auxiliary doors, as you'd see on an aircraft ground-running, taxiing or taking off, but are poorly done. Same old kit! The GR.3 issue of this old old kit has some additional bits - a fairly nice Pave Spike, some variable LGBs, dodgy Sidewinders, basic ALQ-101, basic chaff/flare dispensers and awful overwing pylons. It does, however, have an excellent decal sheet covering the two-greys scheme to perfection - watch out for the walkway decals though, they'll fold up in the blink of an eye and are best applied by cutting the separate lines up and applying individually. Given how cheap it can be found second-hand it's worth it for the decals alone - as the various third party decal manufacturers have all made woeful efforts of covering the later RAF Jaguar paint schemes, missing out stencil details etc. entirely from their very expensive and small sheets of decals! Comes in a lovely box with artwork depicting a GR.1 with two seats. Yes, you read that right. This is a cheap knock-off of the Hasegawa kit, with all sorts of corners cut such as mirror image engraving of the fuselage halves (thus the starboard nose is all wrong, as it's a copy of the port nose and therefore misses out details like the refuelling probe door). Definitely one to avoid. Another poor copy of the Hasegawa kit, with much of the surface detail much much poorer (a mixture of raised, fine recessed and trenches). 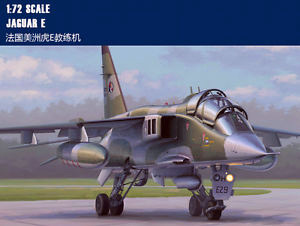 It has all the minor faults of the Hasegawa kit plus many more of its own making. The fit is variable - the intakes are particularly bad. Many (most) panel lines are inaccurate. The decals are rubbish. In general I'd say avoid it like the plague. I certainly wish I had, I started one in 1994 and it looks like I may finally finish it off in 2016... all the work it's taken to look half decent would have been better spent on just buying a Hasegawa kit and some resin or etched bits instead. 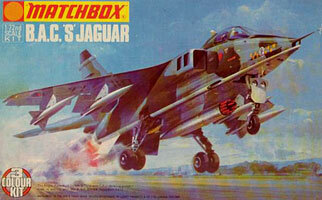 Not one of Matchbox's finest hours! This kit is a real disaster; the fuselage is all wrong, with the air conditioning intake on the spine too far forward; the rear end of the cockpit too far forward. The wings are pretty naff with no fairings underneath, inaccurate heavy engraved detail (apart from one raised panel!). The stabilisers are similarly bad and lack the curve at the leading edge where they meet the fuselage. The fin is crude and includes a very early version of the RWR fairing, only used on one trials aircraft. Four underwing pylons of fictional design are supplied along with four very crude AS.30 missiles and a belly drop tank/rocket pod combination. None of these are appropriate for an RAF jet of course. No separate airbrakes (and the engraved lines for them are inaccurate along with every other line), gear bays (what there are of them) wrong size. Cannon fairings totally wrong. Intakes too small and square with a pronounced slope on the top side. Cockpit... well...! Awful awful awful attempt at a seat and the standard Matchbox jet pilot, and that's it - nowt else. Jet pipes far too shallow. Sink marks in various places. Very basic decals (XX108 and XX116 of 6 and 54 Squadrons) in the 'S' release; slightly improved ones (XX726 and XX721 of 6 and 54 Squadrons) in the later GR1 release. Basically another one to avoid! Unsurprisingly, shares many of the faults of the GR.1 boxing though they really are two different kits and not just the same one with a different nose. The fuselage in this kit is a whole new part in comparison to the single seater boxing, and has been just as effectively messed up - now the forward end of the cockpit too far back and the entire length too short by several feet. The canopy as a result, bears no relation to the real thing. The end of the nose certainly doesn't look like it's from a Jag! The fin is poorly moulded and basic but more or less correct in shape in this boxing. Given this is a T.2 there shouldn't be a cannon on the starboard side, but there it is. Two drop tanks (with integral wing pylons) are provided but the shapes are way off. This kit is absolutely godawful and manages to actually be worse than their atrocious GR.1. Contributions welcome - Airfix (reboxed by Italeri), Esci and Kitty Hawk all have offerings - the Kitty Hawk kits have some shape issues in areas and are apparently a pig to build with ill-fitting parts and warped fuselage halves but are nicely detailed, albeit expensive.